Haiti has earned the dubious distinction of being one of the poorest nations, on a per capita basis, in the world. Even the country’s relatively recent transition from authoritarianism to democratic rule was not enough to spark liberal-market reform and the country’s integration into the global economy. The Haitian people have thus been confined to decades of deprivation, under a variety of regimes that span the political spectrum. Despite the rapid series of regime changes that have occurred in Haiti over the past twenty five years, fundamental shifts in the nature of the state have not materialized. Haiti is essentially a case of economic non-reform; it has failed to undergo neoliberal reforms and become integrated in the global market. As the country moves away from dictatorship and through a series of democratically elected governments, it becomes increasingly evident that the nature of the country’s economic program is not dependent on ideology. Neither dictator nor elected president has been able to modernize Haiti’s devastatingly backwards economy. Instead, economic programs are designed in a context of pervasive political instability; their character is therefore dictated largely by pragmatism and a need to ‘crisis manage’. Regime type in Haiti is inconsequential; what determines whether neoliberal reform is initiated is regime stability. This decisive element is, in turn, dependent on a host of factors, from institutional strength, to the nature and extent of international involvement. Since the fall of the Duvalier dictatorship, Haiti has witnessed a rapid succession of political leaders. After Francois Duvalier won the presidency in 1957, his rule quickly degenerated into a brutal dictatorship. Duvalier and his son would rule Haiti by authoritarian decree for a combined twenty-nine years, their command ending in February 1986. It was only in 1990 that Jean-Betrand Aristide became Haiti’s first democratically elected President, with Rene Preval as his Prime Minister. But even this elected government was only able to serve seven months in office, before being overthrown in a coup and replaced by a military-backed regime that ruled for four years before Aristide was reinstated.1 The constitution forbids consecutive terms, but allows for reelection.2 For this reason, power over the past decade has thus been passed between Aristide, Preval and a number of transitional governments.3 After Aristide failed to serve out his third term, Rene Preval was re-elected on February 7, 2006. Two characteristics define the Haitian economy. One is its lack of real growth over the past half century; the other is the lack of correlation between the regime in power and the nature of the economic program. Haiti is one of the poorest countries, on a per capita basis, in the Western Hemisphere. While real growth in GDP averaged 5.2% in the years following Duvalier’s dictatorship, it fell to 2.9% in 1996, and has since dropped to less than 1%.4 The transition from military rule to democratic governance has not witnessed a simultaneous growth in the economy; Haiti is poorer in real terms today than it was in 1955, before Duvalier assumed control.5 It faces not just stagnation, but actual decline. According to Robert Fatton Jr., “Haiti still hovers on the verge of political catastrophe; it faces economic ruin.”6 Moreover, the system of rapidly changing regimes further works against neoliberal reform by preventing any type of coordinated strategy for reform from being implemented. With respect to the nature of the economic program, there is no apparent correspondence between authoritarianism and state intervention, or alternatively, between democracy and the goal of free-market reform. Jean-Claude Duvalier, the second Duvalier dictator, embraced a “relatively ‘open’ technocratic project.” Unlike his father, he promised “economic revolution;” his limited efforts towards liberalization in the 1970s allowed for modest integration into the global economy and additionally contributed to a resurgence of civil society.11 In contrast, Aristide, the first president to be elected under free-and-fair elections, released “multiple condemnations [against] imperialist and capitalist exploitation” and denounced [the World Bank and the IMF] “as vile capitalist instruments sucking Haiti’s blood.”12 Thus, in Haiti, there is no defining relationship between regime type and economic strategy. Rather, the process is astonishingly capricious; leaders have the political autonomy to embrace or reject neoliberal reform according to their own whim. Economic policy in Haiti is dictated by a need for pragmatism, rather than by ideology. For example, Fatton Jr. argues that despite his radical socialist rhetoric, Aristide committed himself to a fairly moderate economic program. He had few alternatives. Recognizing the need to maintain relations with the ‘nationalist bourgeoisie’, to court international investment, and to coexist with international organizations, “Aristide acquiesced to a program of structural adjustment designed by the World Bank and the International Monetary Fund … He espoused strict fiscal austerity, an anticorruption drive, and the modernization of public enterprise. These economic reforms achieved significant success and gained massive international support.”13 Thus, limited neoliberal reform was finally embraced in Haiti only because the international and domestic systems demanded it. Amidst this violence, governments are faced with a situation in which they must ‘crises manage,’ rather than rule. According to Alex Dupuy, the sole task of the provisional government, which took over prior to Preval’s reelection in 2006, was “to pacify the country… and this basically meant cracking down on Aristide supporters.” Rather than dedicating itself to reform, the administration was limited to pursuing a ‘scorched-earth strategy,’ which involved rounding up and arbitrarily arresting prominent Aristide party officials.17 Einsiedel and Malone further assert that this policy of ‘crises management’ has been reflected in the nature of UN involvement in Haiti; while the UN previously was involved in a broad range of activities, its efforts have subsequently been “reduced to a small international police force aimed at building a domestic police capacity.”18 The UN, subject to the same restrictions as the domestic government, must too limit its role to policing. The weakness of political institutions and the lack of an autonomous civil society prevent both governments and non-state organizations from effectively challenging state power. Unable to act as an authoritative counterbalance to state control, these groups are incapable of influencing the policy-making process and spurring the adoption of neoliberal reform. Even if effective economic strategies were developed, Haiti’s weak institutional foundation would prevent its implementation. 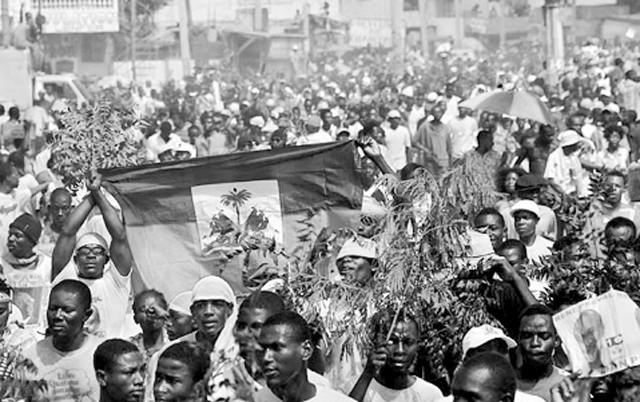 According to Robert Fatton Jr., Haiti is plagued by a lingering authoritarian legacy. While democratization eliminated “the most flagrant tyrannical aspects” of the old regime, the current administration is still built upon the foundations of authoritarianism.21 As a result, the constitution has produced an immobilism that continues to favor the status quo and act as an obstacle to reform. Thus, weak institutions have made the government incapable of ruling. Importantly, the current institutional weakness is a political remnant of authoritarianism; weak institutions similarly limited economic reform under dictatorship and under democracy. Since the power of political leaders is unchecked, and since politics has become virtually the only means of material advancement, leaders resist demands to open up the Haitian economy to international pressures. Rather, they work to maintain a closed system which they can more easily exploit.23 Evidence of rent-seeking behavior is widespread. Consistently high levels of corruption suggest that change will not soon be readily implemented from above. Haiti ranked last on the 2004 Transparency International Corruption Index.24 Weak institutions have allowed decades of interest-maximizing leaders, of both authoritarian and democratic backgrounds, to hold back neoliberal reform. An unstable governmental structure permits political infighting to yield not compromise, but stagnation. The clearest example of this political stagnation is the 1997 leadership succession conflict. In 1997, Prime Minister Rosny Smarth resigned in protest over the outcomes of the senatorial elections. Following his recognition, the parliament refused to approve any of Preval’s appointments for a successor and the country was left with no Prime Minister for two years. Preval was forced to rule by decree and to implement only the most basic policies.28 Political stalemate ensued because state authorities were incapable of forming a functioning government. In the context of an institutional system that does not guarantee a working political body, internal conflicts render governments unable to enact meaningful, long-term reform. Arthur S. Banks, et al. eds. Political Handbook of the World 2005-2006. (Washington: CQ Press, 2006), 482-483. Alex Dupuy. “Haiti Election 2006: A Pyrrhic Victory for René Préval?” Latin American Perspectives 248 (2006): 133. Arthur S. Banks, et al. eds. Political Handbook of the World 2005-2006. (Washington: CQ Press, 2006), 483. Arthur S. Banks, et al. eds. Political Handbook of the World 2005-2006. (Washington: CQ Press, 2006), 482. “Haiti: An Uphill Struggle.” Economist 379 (2006). Robert Fatton Jr.. “The Impairments of Democratization: Haiti in Comparative Perspective.” Comparative Politics 31 (1999): 222. Irma Alonso T., ed. Caribbean Economies in the Twenty-First Century. (Gainesville, Florida: University Press of Florida, 2002), 55. Arthur S. Banks, et al. eds. Political Handbook of the World 2005-2006. (Washington: CQ Press, 2006), 485. Irma Alonso T., ed. Caribbean Economies in the Twenty-First Century. (Gainesville, Florida: University Press of Florida, 2002), 56. Robert Fatton Jr.. Haiti’s Predatory Republic: The Unending Transition to Democracy. (Boulder: Lynne Rienner Publishers, 2002), 57. Robert Fatton Jr. Haiti’s Predatory Republic: The Unending Transition to Democracy. (Boulder: Lynne Rienner Publishers, 2002), 79. David M. Malone and Sebastian Von Einsiedel. “Peace and Democracy for Haiti: A UN Mission Impossible?” International Relations 20 (2006): 163. Alex Dupuy. “Haiti Election 2006: A Pyrrhic Victory for René Préval?” Latin American Perspectives 148 (2006): 132-133. David M. Malone and Sebastian Von Einsiedel. “Peace and Democracy for Haiti: A UN Mission Impossible?” International Relations 20 (2006): 153. Robert Fatton Jr. Haiti’s Predatory Republic: The Unending Transition to Democracy. (Boulder: Lynne Rienner Publishers, 2002), 38. Janelle Conaway. “Help for Haiti.” Americas 58 (2006). Robert Fatton Jr. “The Impairments of Democratization: Haiti in Comparative Perspective.” Comparative Politics 31 (1999): 209. Robert Fatton Jr. Haiti’s Predatory Republic: The Unending Transition to Democracy. (Boulder: Lynne Rienner Publishers, 2002), xi. David M. Malone and Sebastian Von Einsiedel. “Peace and Democracy for Haiti: A UN Mission Impossible?” International Relations 20 (2006): 154. David M. Malone and Sebastian Von Einsiedel. “Peace and Democracy for Haiti: A UN Mission Impossible?” International Relations 20 (2006): 164. Devesh Kapur and Moises Naim. “The IMF and Democratic Governance.” Journal of Democracy 16 (2005): 89. Robert Fatton Jr. “The Impairments of Democratization: Haiti in Comparative Perspective.” Comparative Politics 31 (1999): 221. David M. Malone and Sebastian Von Einsiedel. “Peace and Democracy for Haiti: A UN Mission Impossible?” International Relations 20 (2006): 157-158. Arthur S. Banks, et al. eds. Political Handbook of the World 2005-2006. (Washington: CQ Press, 2006), 486. Robert Fatton Jr. “The Impairments of Democratization: Haiti in Comparative Perspective.” Comparative Politics 31 (1999): 222. Robert Fatton Jr. “The Impairments of Democratization: Haiti in Comparative Perspective.” Comparative Politics 31 (1999): 216. Robert Fatton Jr. Haiti’s Predatory Republic: The Unending Transition to Democracy. (Boulder: Lynne Rienner Publishers, 2002), 34. Robert Fatton Jr. “The Impairments of Democratization: Haiti in Comparative Perspective.” Comparative Politics 31 (1999): 218. Robert Fatton Jr. Haiti’s Predatory Republic: The Unending Transition to Democracy. (Boulder: Lynne Rienner Publishers, 2002), 9. Robert Fatton Jr. Haiti’s Predatory Republic: The Unending Transition to Democracy. (Boulder: Lynne Rienner Publishers, 2002), 37. Peter Smith. Talons of the Eagle: Dynamics of U.S.-Latin American Relations. Oxford, 2000. David M. Malone and Sebastian Von Einsiedel. “Peace and Democracy for Haiti: A UN Mission Impossible?” International Relations 20 (2006): 165. Alex Dupuy. “Haiti Election 2006: A Pyrrhic Victory for René Préval?” Latin American Perspectives 148 (2006): 133. Robert Fatton Jr. Haiti’s Predatory Republic: The Unending Transition to Democracy. (Boulder: Lynne Rienner Publishers, 2002), 88. Robert Fatton Jr. Haiti’s Predatory Republic: The Unending Transition to Democracy. (Boulder: Lynne Rienner Publishers, 2002), 39. Robert Fatton Jr. “The Impairments of Democratization: Haiti in Comparative Perspective.” Comparative Politics 31 (1999): 220-222. Robert Fatton Jr. Haiti’s Predatory Republic: The Unending Transition to Democracy. (Boulder: Lynne Rienner Publishers, 2002), 29. Arthur S. Banks., et al. eds. Political Handbook of the World 2005-2006. (Washington: CQ Press, 2006), 482. Kurt Weyland. “Neoliberalism and Democracy in Latin America: A Mixed Record.” Latin American Politics and Society 46 (2004): 137.